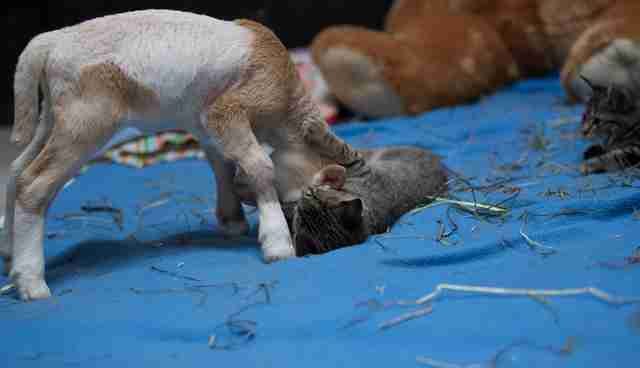 Snow Tiger, as the tiny kitten is called now, was born to a stray mother and ended up being rescued by an animal sanctuary. 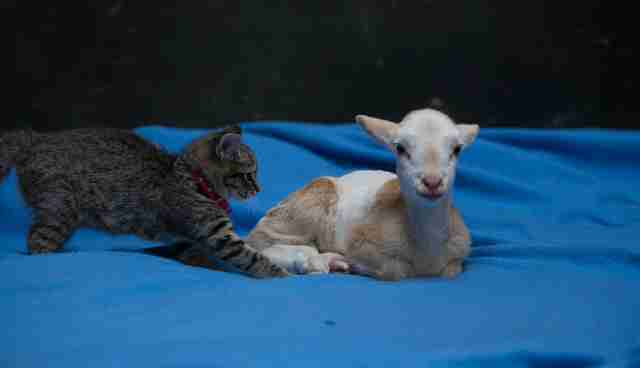 Little did the kitten know, still fierce and untrusting of people, that she'd bond with another new resident - a lamb. 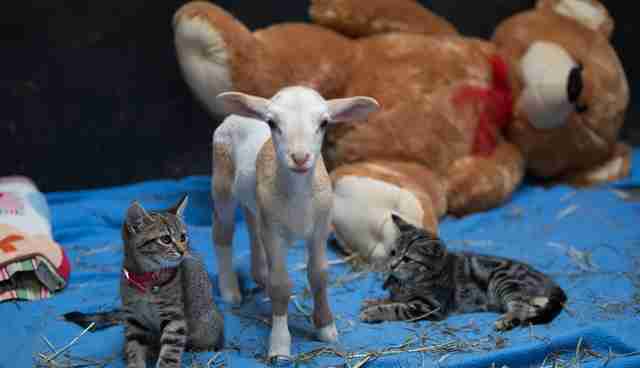 Fifi was rescued from a meat farm after her mother died, and came to Edgar's Mission Farm Sanctuary in Victoria, Australia, missing her mom terribly. This twist of fate likely saved Fifi from Australia's controversial "live export" industry. Snow Tiger was rescued with her sibling, now called Snow Leopard. Both have taken a liking to Fifi, the new member of their litter, who also happens to be a lamb. But being a little different from the kittens doesn't stop Fifi from feeling like he has a place in the world. 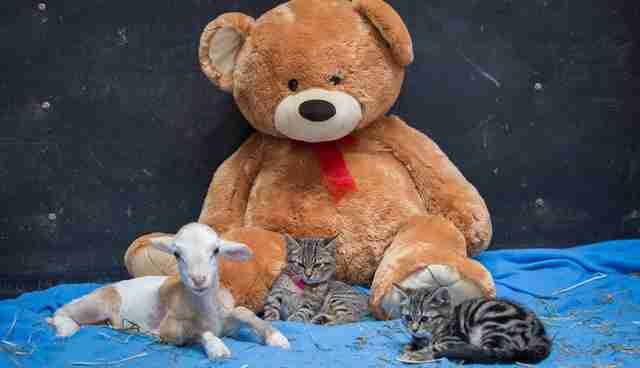 "Fifi is just so curious (like all little babies) and loves exploring things, especially kittens," Pam Ahern, the founder of Edgar's Mission, told The Dodo. And Fifi's innocent curiosity has brought out the best in Snow Tiger. "It is amazing to witness the turn around of Snow Tiger from frightened, spitting and scratching kitty, to purring bundle of fur who just wants to cuddle up for love," Ahern said. And Fifi and Snow Tiger aren't the only ones to forge bonds across the boundaries of species. Edgar's Mission is full of stories like this, showing that love just doesn't discriminate. "We love watching the different species interact here at the sanctuary, their non-judgmental ways is something we humans could well emulate," Ahern said. "They never care how one looks." Click here to pitch in to help the animals at Edgar's Mission.